Point-to-multipoint is treated as a collection of point-to-point links and thus no DR/BDR is required. Point-to-Point is a single link and no election is needed. Broadcast: OSPF routers on broadcast networks will elect a DR and a BDR (since it is multiaccess) – OSPF packets are multicast. NBMA: Routers will elect DR and BDR (since it is multiaccess), but since it is a non-broadcast, routers will have to communicate via unicast rather than multicast. OSPF can be a mystery to some. Understanding the default timeouts can be helpful in troubleshooting. Some vendors change these times so it is very important to realize this stuff if you start mixing vendors in your OSPF domains. 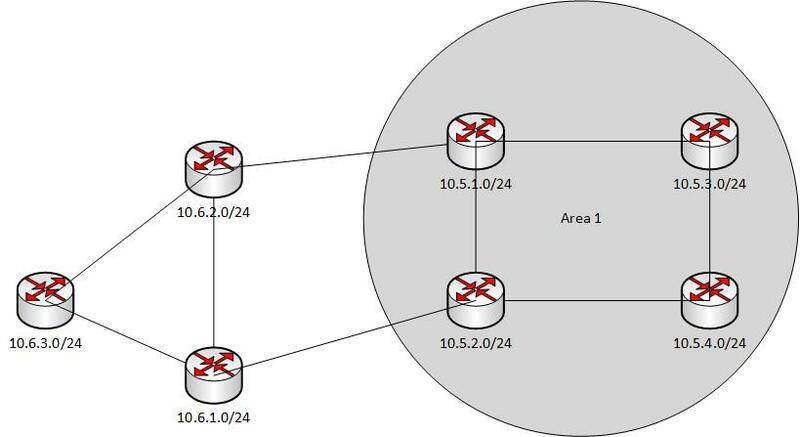 OSPF areas are one of the more common topics I am asked about as networks grow. Before we dig into this, we need to understand the reasons why OSPF areas were created in the first place. Next, we will go into how to apply areas to modern network designs. Why did areas come into being? Let’s rewind to a time where RAM in routers was very expensive. Processors were expensive. One of the biggest reasons OSPF areas came into play was ram limitations. Every route in your routing table takes up ram. The more routes you have the more ram that is taken up in each router to hold that table. Also, in order to calculate these routes processor power is used up. So what do areas do for me? OSPF areas have many advantages. However, in most WISP and ISP networks they serve two purposes. The first purpose is they group similar devices into logical groups. These groups can have filtering policies applied to them. The second purpose is more important. Implementing areas reduces the size of the routing table. By doing this your routers spend less time calculating routes, and less time updating the database during a topology change. By reducing the routing table you also speed up what is called convergence time. This is the time the entire network needs to agree on the current routing topology. If a major backbone link is flapping your routers could be spending a fair amount of their resources calculating routing tables. An important thing to note with implementing areas is you must have a good IP network design. This means your sites/pops/towers should have a logical design which allows for easy route summarization and consolidation. If you are looking into areas make sure you can summarize your routes in that area easily. The following examples illustrate why this is important. In the above example we have created “Area1”. Since we have a good IP network design we can summarize our routing table in and out of area1 into a few different ways. If we want to reserve the whole 10.5.0.0/16 for future expansion then we can. Or if we want to break this down into 10.5.0.0/20 or even smaller we can. Part of this depends on growth plans. With areas you have to keep in mind every area needs to touch the backbone (area 0.0.0.0) directly. Now, you can use Virtual Links to have one non-backbone area traverse another non-backbone area. However, even though is a standard, is a workaround at best. There are many disadvantages to virtual links. Now, back to our example. If we create an area the 10.6.1.0/24 and 10.6.2.0/24 routers are the “in roads” to Area1. These are known as area border routers (ABR).The main function of ABRs is to summarize sub networks found throughout the OSPF network. It stores many copies of its link-state database in memory when one of the stored copies shows an area where the actual router is connected. The ABR holds a minimum of two copies of the routing tables. One from the backbone area, and one from each area it is connected to. But, I thought areas were supposed to cut down on ram and CPU usage? Well, everything has a tradeoff. This is where the philosophy side of things come into play, and probably the reason you have read this far. When, how, and should I implement areas? In today’s modern world with fast ram, fast links, and fast processors OSPF areas are needed less and less. Routers today have more ram than even 5 years ago. This means they can hold larger routing tables and do more calculations. If you are thinking about implementing areas the first thing to look at is your IP design. In order to take the best advantage of areas you should have a logical, and congruent design. What I mean by this is your towers should be able to summarized as much as possible. If you can fit 20 towers into a single route statement that is one good place an area would make sense. If those 20 towers are not able to be summarized then adding an area is not going to be much of a benefit to you. Network size does not necessarily dictate the need for OSPF areas. If you have a neatly summarized IP network the need for areas is lessened. What about if you are trying to join two different networks? Say you purchased a neighboring ISP and want to join the new network with your own. If you have overlapping IP space then things might not mesh together well, even with areas. Most times you are better off running BGP with the two separate networks. This allows each network to have it’s own space, own routing policies, but still be able to share bandwidth and other resources. You simply don’t announce any overlapping space to each network until things are re-numbered. One question I get in this scenario is my router can’t handle BGP. BGP is a fairly lightweight protocol. The issues arise when you start pulling in full or partial internet routing tables. This is the same concept as mentioned above with the OSPF routes.